Spotlight: Lovely Pre-GWTW Leigh (Post Five) | THAT'S ENTERTAINMENT! Welcome to another Film Friday! 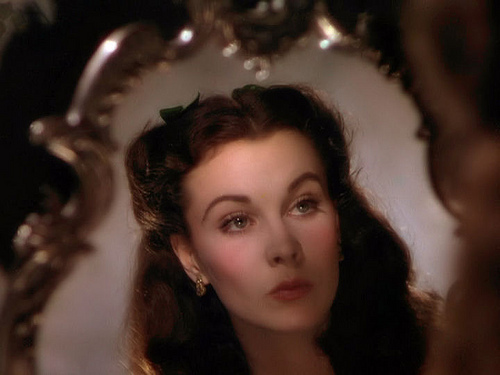 Today’s post is dedicated to the beautiful Vivien Leigh, star of Gone With The Wind and A Streetcar Named Desire, whose 100th birthday occurred on the fifth of this month. That’s Entertainment! is doing its part by covering five films that Vivien Leigh made before her iconic trip to North America when she snatched the role of Scarlett O’Hara away from dozens of hopefuls. Note that none of these films are Pre-Code, but they’re all Pre-Scarlett. 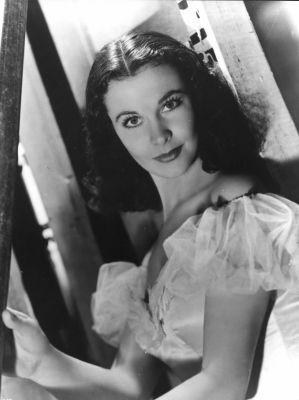 Vivien Leigh was born Vivian Mary Hartley on November 5, 1913 in Darjeeling, India. Her father was an English officer in the Indian calvary. Vivian was sent to the Convent of the Sacred Heart at age six, but spent the better part of her childhood traveling around with her father, attending schools in England, France, Italy and Germany. She enrolled in the Royal Academy of Dramatic Art in 1931, but put her acting ambitions temporarily aside to marry lawyer Leigh Holman. She gave birth to their daughter, Suzanne, in 1933. Vivian returned her sights to acting in 1935 and made both her stage and screen debuts that year in London. But first, her agent advised her that a name change was in order. 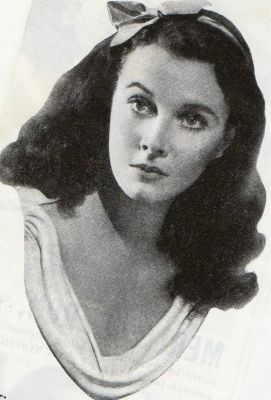 Vivian Holman became Vivien Leigh. 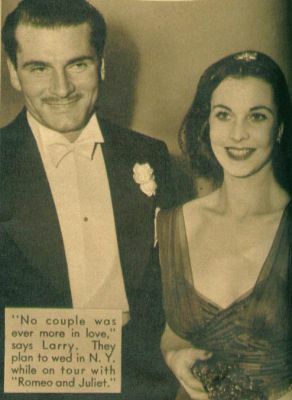 Vivien first met Laurence Olivier in 1935, and by 1937 they were appearing together on stage in Hamlet and on screen in Fire Over England. During this time, a romance developed between the two. Leigh and Olivier left their respective spouses and co-habitated clandestinely. 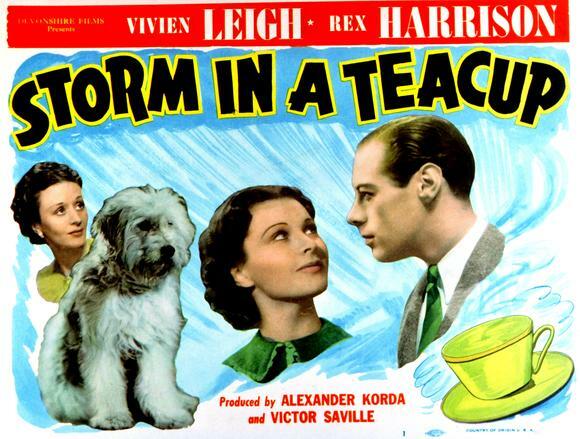 Leigh continued to appear in theatre and in films, garnering small acclaim for pictures like Storm In A Teacup (1937) and MGM-British’s A Yank At Oxford (1938). Olivier was signed for the motion picture version of Wuthering Heights and went West to Hollywood. His lover followed suit and “conveniently” caught the eye of producer David O. Selznick, who was frantically searching for a Scarlett O’Hara. (You can read more about that here.) She got the role and became a part motion picture history, even winning an Academy Award. Leigh and Olivier went to New York and produced their own version of Romeo And Juliet. It was a flop and the duo returned to Hollywood to star together in That Hamilton Woman (1940). By this time, they’d both been granted divorces from their spouses and were wed on August 31, 1940. The newlyweds returned home to London in 1941. 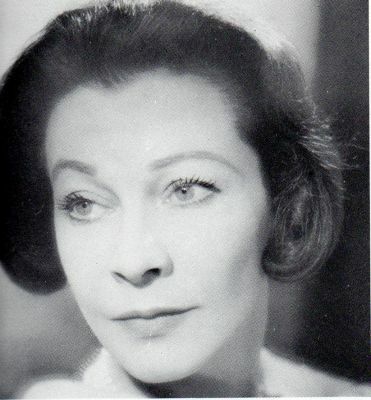 Vivien continued to work on the English stage and even toured North Africa in 1943. Her last two films of the decade were neither great successes, and Leigh faced hardships — a miscarriage and then an attack of tuberculosis. But she was able to find success in the London production of The Skin Of Our Teeth and in 1948 toured Australia and New Zealand with Olivier. In 1949, Olivier directed Leigh in the London production of A Streetcar Named Desire. Vivien was soon cast in the 1951 film adaptation, winning great reviews and another Academy Award. She went back to London and played both Antony And Cleopatra and Caesar And Cleopatra with Olivier, eventually bringing the alternating shows to New York. But Vivien’s increasingly erratic behaviors soon caught up with her. She had a nervous breakdown in 1953. Struggling through mental illness, Vivien continued to perform on stage with Olivier throughout the decade and did another film for Alexander Korda. She suffered another miscarriage in 1956, and her marriage to Olivier began to deteriorate. As she began an affair with Jack Merivale, Olivier began seeing Joan Plowright. They divorced in 1960. Leigh made another film in 1961 and toured with Merivale in 1962. In 1963, she went to Broadway and starred in the musical adaptation of Tovarich, for which she won a Tony Award. Her last film, Ship Of Fools, was released in 1965. 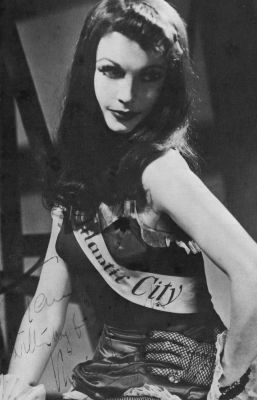 She made a few more stage appearances, before being diagnosed with a recurrence of tuberculosis in 1967. She passed away on July 8, 1967 at the age of 53. So far we’ve covered St. Martin’s Lane [a.k.a. Sidewalks Of London] (1938), A Yank At Oxford (1938), Dark Journey (1937), and 21 Days Together [a.k.a. 21 Days] (1940). 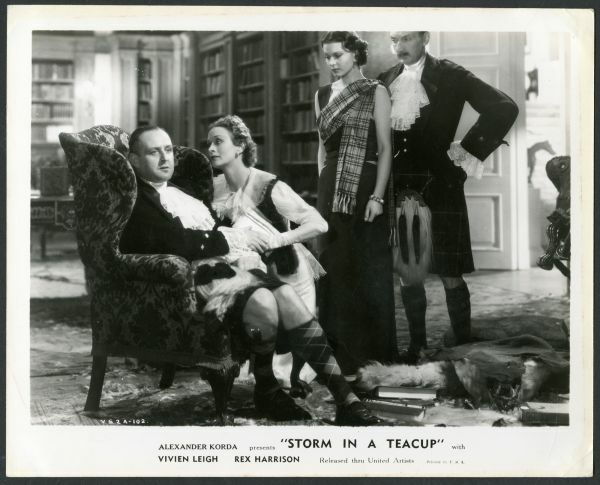 Our final Leigh film is Storm In A Teacup (1937). 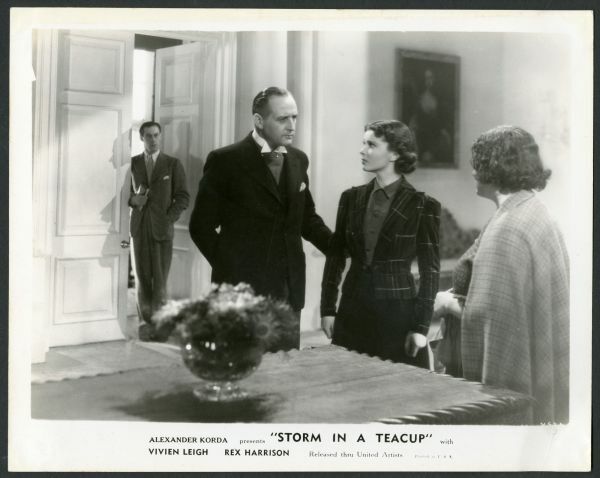 Starring Vivien Leigh, Rex Harrison, Cecil Parker, and Sara Allgood. Written by Ian Dalrymple and Donald Bull. Based on the play by Bruno Frank as adapted by James Bridle. Directed by Ian Dalrymple and Victor Saville. This simple and amusing tale is veddy veddy British, but was actually one of the few Pre-GWTW Leigh films to be released in the USA. 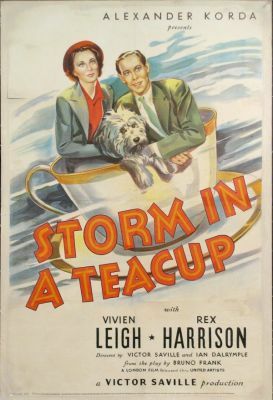 Perfectly in line with its title, Storm In A Teacup concerns a trivial court case that arises when a provost (mayor) demands a local woman’s dog be put down. Of course both the public and his daughter, played by Leigh, try to convince him otherwise. Meanwhile, Harrison and Leigh’s relationship complicates things. Victoria Gow and reporter Frank Burden have a brief, chance meeting as they disembark from a ship at Baikie, on the west coast of Scotland. After Vickie leaves, Frank observes the police enter the cottage of Honoria Hegarty and seize her dog Patsy for non-payment of fines. Meanwhile, Vickie is reunited with her father, Willie Gow, the Provost, and learns that he now believes himself to be a man of destiny and has joined the Scottish Nationalist Party, hoping to win its nomination for a seat on the town council. Frank and Vickie encounter each other again at a town council meeting, where Frank offends her by his comments about her father. Gow gives Frank an officious interview, which is interrupted by Hegarty’s complaints about her treatment. Both Vickie and Frank are sympathetic, but Gow ignores her, so Frank changes the headline to note the dog incident. Before Gow can see the morning paper, he addresses a planned rally, where he is jeered with imitation dog barks as the crowd shouts him down. Gow believes that Frank set up the mob, but Vickie knows he is innocent. Just as Frank is about to help Gow, he learns that Hegarty’s ice cream truck has been seized, which means war between the two men. I actually don’t have a lot to say about this film. It’s pleasant and at times pretty entertaining, but I’m certain that it’s not suited for most viewers. What I liked most about this film was its sense of triviality, which is immediately established by the expression from which the film is titled. There are several funny scenes that arise from the premise — choice being the sequence in which Harrison’s character sets dozens of dogs loose in Willie’s house. But make no mistake — this is a simple and rather quiet film, not intended for American audiences who are unaccustomed to British filmmaking of the era. It’s neither flashy nor glamorous. If you’re easily distracted, this isn’t the film for you. 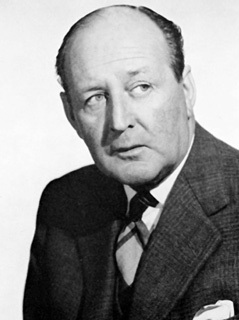 Leigh and Harrison have adequate chemistry, but most of the film belongs to Cecil Parker as Dow. (He does, after all, have the meatiest role.) Parker is obligated to play a villain without losing the humanity. By that, I mean, he doesn’t have to go overboard to demonstrate that he’s the antagonist of the film. Also, he’s never too unlikable because, although he’s certainly in the wrong, the tone indicates that he will come around by the end of the picture. Of course, he does, and the final court scene is satisfying. Though Leigh and Harrison are the “names,” the real strength of the picture lies in the hands of Parker and all the assorted character actors and actresses. Beyond being one of Leigh’s early films, the film’s merit lies strictly in its Anglicized appeal — it’s stylized storytelling, talent, and humor. So if that’s your cup of tea, Storm In A Teacup is an enjoyable way to spend an hour-and-a-half. 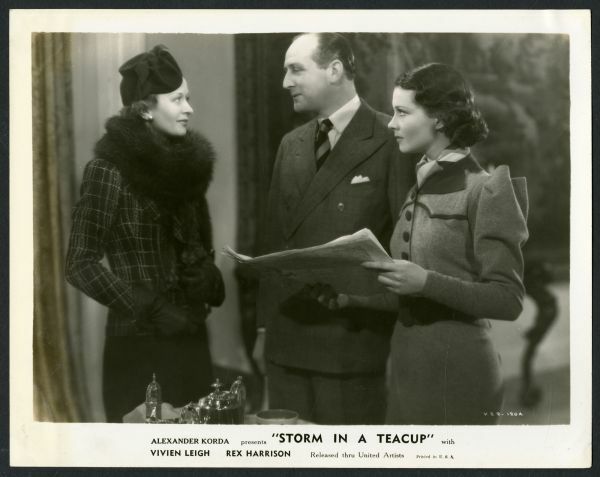 If that’s not your cup of tea, there’s always the Leigh picture made by MGM-British, A Yank At Oxford (1938). Or stick to her post-Scarlett films. Come back in seven days as Film Fridays in December are being overtaken by Diamond Lil herself, Mae West! And tune in on Monday for the start of a whole new week of fun on That’s Entertainment!